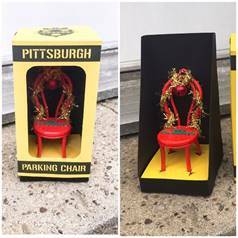 From YaJagoff Media and the artist David Calfo and Andrew Paul comes the The Pittsburgh Parking Chair Christmas Ornament. If you are a fan on YaJagoff you know he has had a great running joke with the public and the parking chair. A few years ago YaJagoff entered the Anything That Floats race and the boat was built by Dave Calfo the boat adorned a gigantic chair constructed out of cardboard. It made the entire voyage from PNC Park to Heinz Field. Fast forward to last summer where Pittsburgh welcomed its first Red Bull Flugtag and once again YaJagoff and Dave teamed up and built the Flying Parking Chair. The team for the Flugtag also included Andrew Paul a local artist who owns Run Rabbit Gliding that create beautiful signage with gold and silver. The history of the Pittsburgh Parking chair has a few different meanings. For the winter time It is when you clear your spot on a street you put out your “chair” as a placeholder for when you return home. During the warmer months it could be used just as a spot holder for a moving van or just because you want to park in front of your own home. The chair itself is usually of the folding variety, light to carry and sturdy enough not to blow over. Typically it was also from a classic to vintage variety usually dating from the 70’s to late 80’s. To purchase your very own The Pittsburgh Parking Chair Christmas Ornament visit YaJagoff! For more holiday fun follow YaJagoff on all social avenues and tune into the podcast any where you listen to podcasts. For more information on the Chief Yinzerneer Dave Calfo visit http://davidcalfo.com and for more information on Andrew Paul visit http://www.runrabbitgilding.com. And lastly this holiday: Don't be a Jagoff, YaJagoff!